Do you have to mesh your bin cage because Im thinking, but just for extra space and toys etc..
Fred my 7 month old Syrian! Yes you have to mesh a cage, you'd never leave the lid off because your hamster could escape, fall out, get attacked or something could fall on him or her. You always need to have a secure home for a pet. Well, not necessarily, but then that'd mean that A) the bin has really tall walls you know your pet can't scale and B) that you have no other pets that might want in. I've left the cover off before and everything was fine, but it's always nice to have the meshed lid just in case you need it. I wouldn't say it was necessary to mesh a tall bin cage if you have no other pets in the house. I love this style of cage and am strongly considering making one. Could I ask if people have added levels for the same hamster to make a multi-stori cage? Presumably it would be possible to add tubes to climb to another level but I was wondering what sort of tubes people have used for a syrian because the rotastak ones are a bit of a tight fit for my fairly big hamster. Here's an old photo of Scamp's bin cage. The tubes in it are just to connect to the rest of her cage and are 100% optional (the bin cage itself is big enough for a syrian anyway). We put wooden shelves in the middle cage and used toys to help her get between them. To connect the three bins we lined them up carefully, then got two much smaller storage boxes, cut the bottom out, then cut holes in both the bottom of the bin and the lid of the one below, with these holes the same size as the smaller storage boxes. To put her cage together we put substrate and toys in the bottom bin, including one below where the hole to the next one will be. Then we put the lid on, then we put the middle bin on there. Then we put the smaller container through the holes in the base and lid, and fill the middle bin as needed, making sure we have a toy on the shelf underneath the entrance to the next bin. Then we put the next lid and bin on, line them up and put the second smaller storage box through the holes. Lastly we fill the top box and put the lid on. Scamp gets between them by climbing onto the toy, through the smaller container and up into the bin above. She can also climb down really easily too. That tutorial is BRILLIANT. It will come in very handy when making my new cage. I'm in love with the idea of bin cages. Apart from being so much more economical compared to shop bought cages, I also think its such a fun thing to do and almost like a bonding exercise with your hamster... Knowing you've built their habitat. I'm SO excited to make mine. 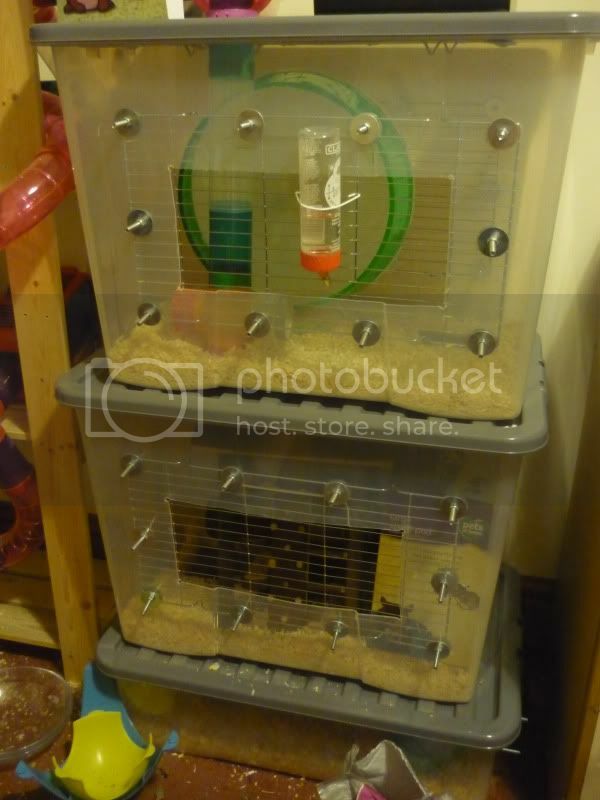 Just a quick question, I was planning on having the bins stacked on top of each other rather than side by side, planning on meshing the sides rather than the lid for ventilation, but then I started thinking about actually taking my hamster out may be difficult if he is in the bottom cage. Are there any other issues with having the bins stacked rather than side by side? Oh, I just saw that Sam stacked them. I'm even more excited!!! They look amazing. The only "problem" with stacking the cages is that you'd need to cut out the sides of the bottom one. In a single story cage, people do it, but it's really not necessary. Leaving the side cut-outs out of the design keeps the cage a lot more chew-proof (and cheaper and easier to make, because the bins are usually a thicker plastic than the lids). The ventilation holes and the top cut-outs are really all you need normally, so if you wanted to have less work, I'd just cut out the walls on the bottom one and leave the top one's side's alone (except for the holes).